Milton Elliott Marcum, 1870-1927. Ulice Huffaker Marcum, 1869-1965. Alexander Cemetery, Monticello, Wayne County, Kentucky. It has taken quite a while to write this blog. 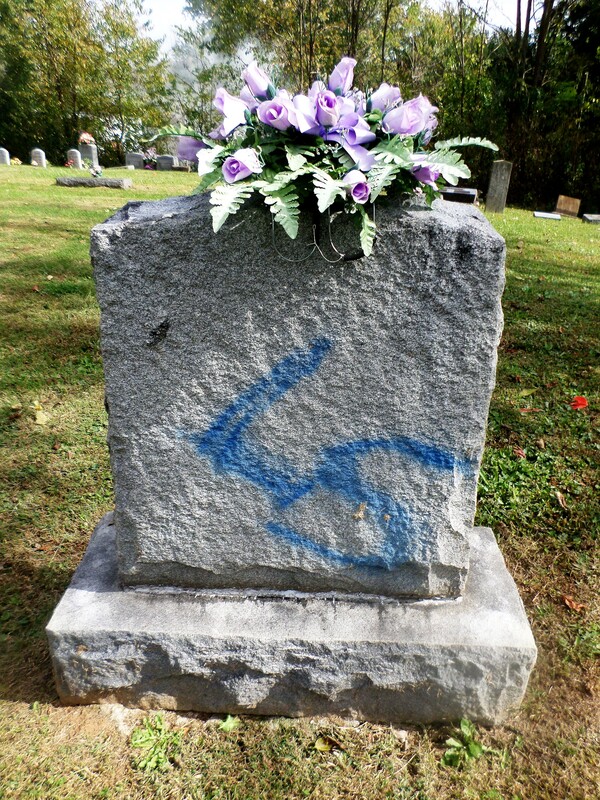 When we visited Alexander Cemetery in Monticello, Wayne County, in October of last year, I was furious to see the damage done to several gravestones in this cemetery. There is absolutely no excuse – celebrating, partying or just hanging out – but spraying stones with blue paint is not acceptable. It is a crime, punishable by jail time, monetary fines, or both. It should be remembered that setting a gravestone after a person dies is the last act of homage to them, their final resting place. It marks their last spot on earth, it is a reminder of the person, and is a holy spot for family and friends to come and remember their loved ones. It is not to be disturbed. 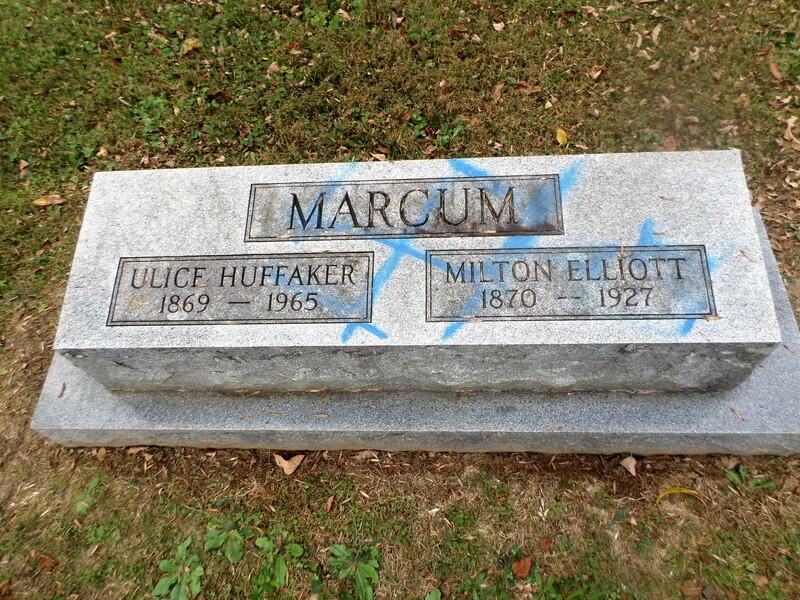 I was shocked to read that Monticello had a problem with vandalism in this cemetery back in 1981. Residents complained about youths drinking and smoking marijuana at night in the cemetery. Melvinia T. Pogue, October 17, 1868 – December 27, 1961. 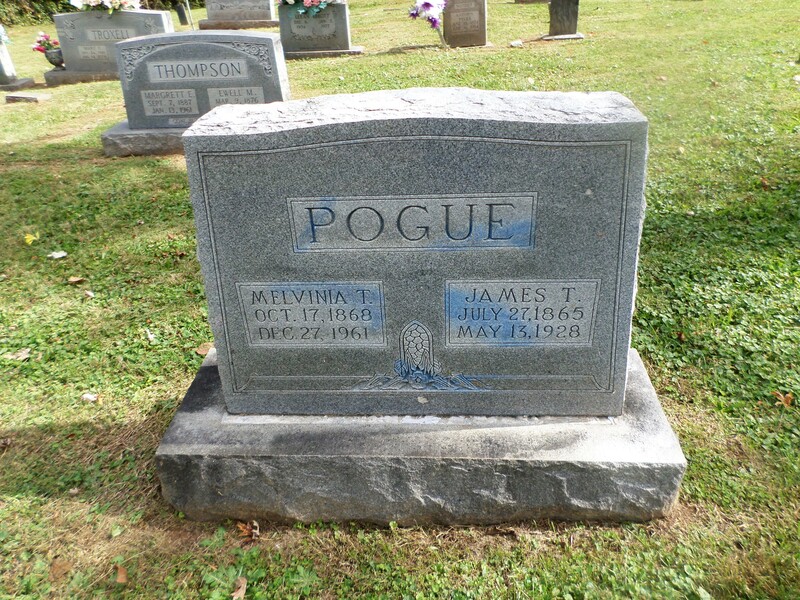 James T. Pogue, July 27, 1865 – May 13, 1928. One of the stones looks as if it has been cleaned, but there can be seen a faint trace of blue on the stone. Charles C. Worsham, 1838-1914. Sarah E. Worsham, 1852-1932. If the perpetrators are found they should be made scrub the stones with toothbrushes – until they are sparkling clean! This infuriates me. Hopefully the culprits are caught and receive appropriate punishment. Respect and responsibility are not at the top of the list when raising children these days. Not all, of course, but for many. I agree wholeheartedly. When I was vice chair of the Indian Council of Georgia, there was a whole village cemetery of the American Indians of the Pre Mississippian period destroyed and human remains scattered by vandals in Burke Co.. Fortunately they were caught and the Council recommended to the judge that the vandals return all artifacts and pay for having the site returned to the way it had been. This happened and a story was published in the National Archaeology Magazine. 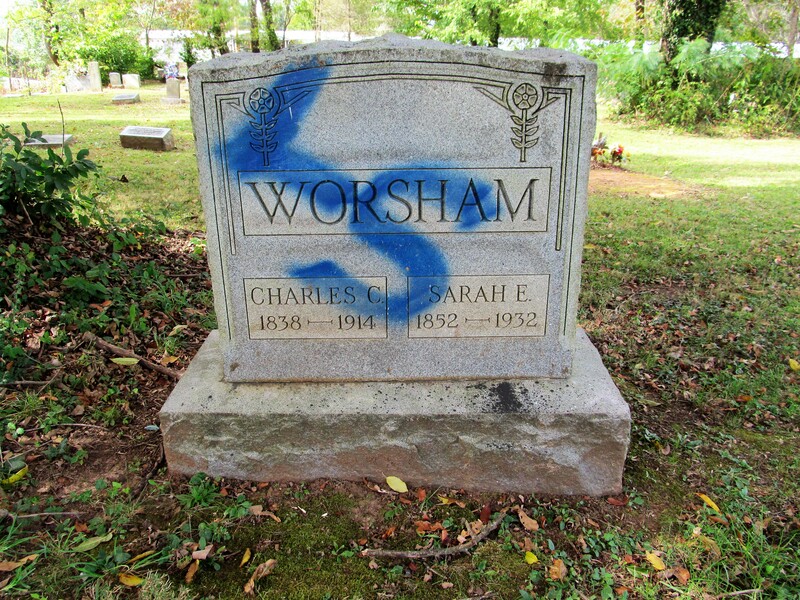 The vandals were also fined in addition and banished from the county for a number of years. All who commit these deeds should be held responsible if possible. Thank you for sharing with us. That is horrible! How could anyone think of destroying a cemetery. It is certainly beyond me. I had to cool off before I could write that blog.